Oh my goodness, I’m absolutely delighted to be this week’s Featured Seamstress on Coletterie! 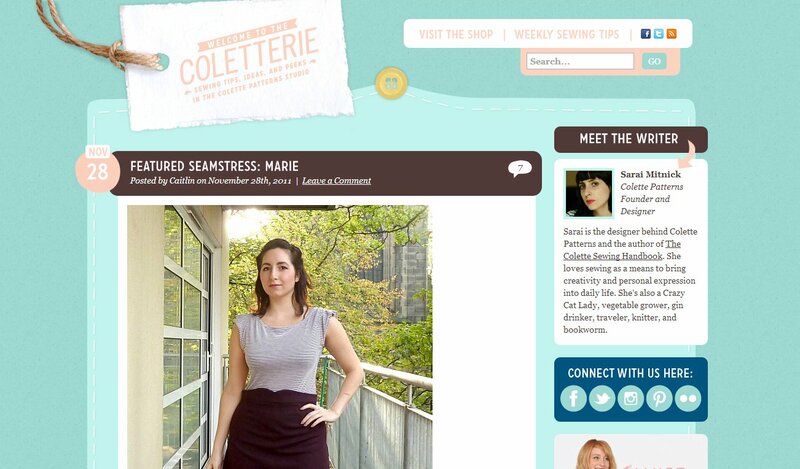 I can’t quite believe it to be honest, especially after seeing the calibre of the other featured seamstresses. My cheeks hurt from smiling! If you fancy popping over to read my interview, you can find it here. It’s my Aubergine Ginger that earned me this esteemed spot…thank you Ginger! Yay! You totally deserve it. That is such a lovely colour and make. how exciting! and well deserved - it's a gorgeous skirt! I *just* read it! Congrats! It's a beautiful make so you deserve the feature. Just saw it too - congratulations! It is a gorgeous skirt tho, so you absolutely deserve it! Eek! I'm so happy for you! Congratulations! This is one of my favorite of your makes! Yay! You totally deserve it - its a beautiful skirt! Go Marie! Thank you all so much for your lovely comments, you guys are great! Yay! Congrats Marie, so happy for you. The ginger does suit you. Going to read the article now.